The Ascension is the last step of the earthly life of Jesus. The last step on a stone which, according to tradition, is just outside Jerusalem, in an area where today most of the inhabitants are Muslims. The edicule itself – a small circular building which commemorates that moment – is Muslim property. Transformed into a mosque in the times of Saladin, it was open whereas now it is has a dome covering it. Christians are allowed to celebrate here offices and Masses only on the Feast of the Ascension. This year, the Franciscans alternated with Greek Orthodox, Armenians, Copts, Ethiopians and Syriacs: like Easter, the feast that commemorates the ascension to Heaven of the Saviour falls on the same date for all the Christian confessions in Jerusalem. According to the rules of the status quo, the celebrations followed on in sequence with precise times on the eve, Wednesday 1st June, and then on the Feast celebrated on Thursday 2nd June. ..
Where is Jesus’ body after the Ascension? 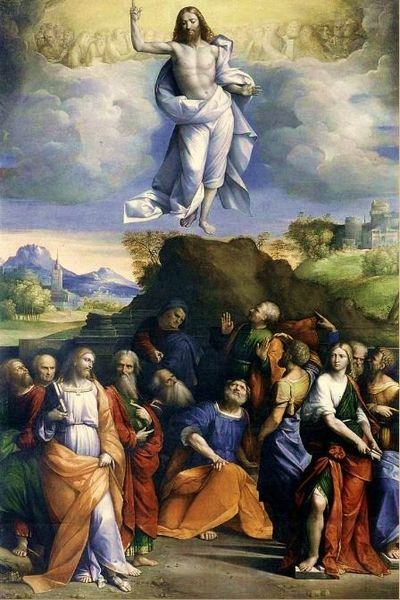 Having already discussed whither Mary was assumed, we turn now to the Ascension of our Savior. Where is the physical body of Jesus? Must we believe that he is “up there” in space somewhere? Can his body be in heaven, if heaven is not “a physical place in the clouds” (as Bl. John Paul II stated)? In this brief article, we will reformulate the essential position already established in our discussion of Mary’s Assumption and, then, we will turn to particular questions and clarifications regarding the current location of our Lord’s glorified body.